I think there's something to be said for introducing the TeachMeet idea to so many new faces in one go, in a place you don't know too well. You don't have any preconceptions (good or bad) about how people will react. In the end, it's always a positive buzz. Technical challenges beset us all at some stage, so in future TeachMeets the rule of No PowerPoints will stand, of course, but be coupled with "anything you want to show must be online and linked to from the TeachMeet wiki page". It also means we can all see the resources people have in advance. In any case, it's the way you tell 'em as much as the site/service/cool thing you're telling us about. I think we also need to find a way to make the new feature of TeachMeets, the roundtables (thanks Jacky), more accessible to those coming in on the www. More cameras, more ways out, more volunteers to work the cams and more Flashmeeting or UStream spaces for people to choose what they see. I think we should look, too, at harnessing the existing community of UStream to bring in new TeachMeeters. Everywhere I go these days seems to feature the white fleece clad staff of this software company, run by a teacher who, it seems, undertakes more than his fair share of feel-good philanthropy. There are 12.3m learners in RSA, 26, 292 schools, so a huge business potential for 2Simple. Using their software, students managed to come up with flash-like animations talking about how to keep healthy, about relationships with those who have HIV. 60-70 children a class, with "uneducated educators" (parents helping as teachers). Where there were computers there were no permissions to use them effectively. Huge challenges, which the 2Simple helped students and teachers partly overcome throughthe Khanya project. By the start of 2012 every educator will be empowered to use appropriate and available technology to deliver curriculum to every learner. The project started in Feb, aiming to show how students' creative writing improves. The aim, to tip the balance between literate, and illiterate, numerate and innumerate. Richard Millwood went all the way to New Zealand to find out what Delight in learning might look at. He's got a quicktime video and PDF to share on his blog. Nic Hughes showed us the Robosapiens, a robot that is playable by good old remote control or programmable through a PC and infrared station. It would make another wonderful introduction to basic programming with a kinesthetic edge. Daniel Needlestone's been working at creating meaningful language lessons - in Chinese with Chinese people. Sarah Hackett really does teach folk fiddle through Moodle, though the business model might still be in the range of free pints at the pub. Peter Sadler showed how Honeycomb has come along, is coming of age, indeed, as more schools see the potential of learning from social networking's participative culture. John d'Abbro's research turning into real classroom creativity is worth a look. Edith Whitehead revealed her trade secrets, namely what the kids do to access the stuff they want online - a packed roundtable talk with much laughter and raised eyebrows. Drew Buddie revealed the secretive sport of rockstacking, and somehow related it to the kind of perseverance and resilience he's helping cultivate in his students through online projects. Finally, Andy Black continually amazes people with his style and tendency to crazy things with expensive mobile gadgets. Tess managed to photograph his latest dunking of a smartphone in a bucket of water. It survived, of course. He's also a great Underground buddy. I keep on missing them! This is awful! 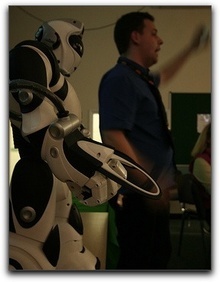 There was a TeachMeet in my hometown of Perth, and I was teaching in London. There was one in London, and I was teaching all day in the north, and wouldn't have been able to make it in time. And now I realise there was one near where I live, and I didn't know about it until too late! (I obviously haven't been visited your blog enough recently!) Is there one place where I can sign up for future 'local' London TeachMeets? Just in case I'm able to make it? Thank you!